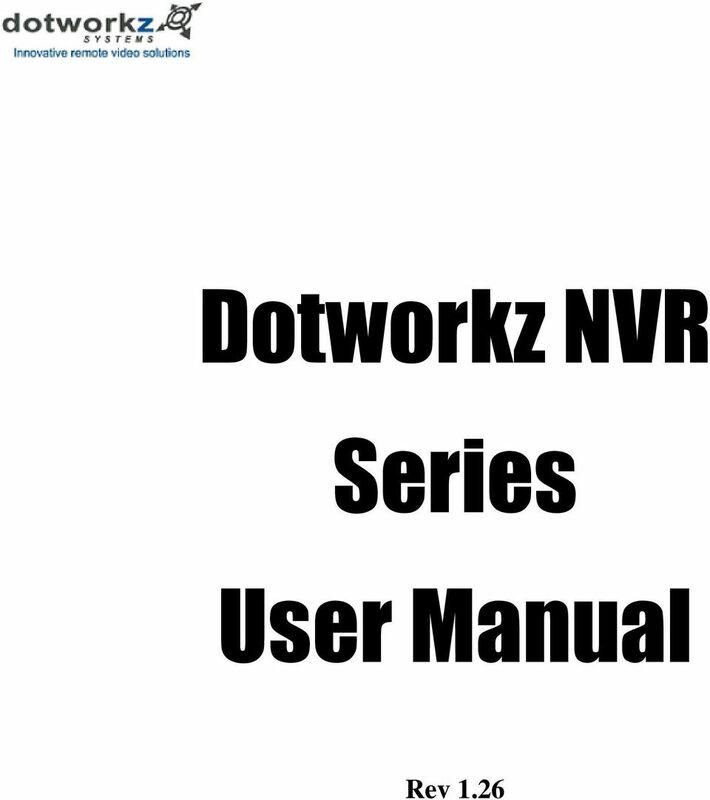 Download "Dotworkz NVR Series User Manual. Rev 1.26"
2 The information in this User s Manual has been carefully reviewed and is believed to be accurate. The vendor assumes no responsibility for any inaccuracies that may be contained in this document, makes no commitment to update or to keep current the information in this manual, or to notify any person or organization of the updates. Please Note: For the most upto-date version of this manual, please see our web site at Dotworkz Systems reserves the right to make changes to the product described in this manual at any time and without notice. This product, including software, if any, and documentation may not, in whole or in part, be copied, photocopied, reproduced, translated or reduced to any medium or machine without prior written consent. IN NO EVENT WILL DOTWORKZ SYSTEMS BE LIABLE FOR DIRECT, INDIRECT, INCIDENTAL, SPECIAL, SPECULATIVE OR CONSEQUENTIAL DAMAGES ARISING FROM THE USE OR INABILITY TO USE THIS PRODUCT OR DOCUMENTATION, EVEN IF ADVISED OF THE POSSIBILITY OF SUCH DAMAGES. IN PARTICULAR, DOTWORKZ SYSTEMS SHALL NOT HAVE LIABILITY FOR ANY HARDWARE, SOFTWARE, OR DATA STORED OR USED WITH THE PRODUCT, INCLUDING THE COSTS OF REPAIRING, REPLACING, INTEGRATING, INSTALLING OR RECOVERING SUCH HARDWARE, SOFTWARE, OR DATA. Any disputes arising between manufacturer and customer shall be governed by the laws of San Diego County in the State of California, USA. The State of California, County of San Diego shall be the exclusive venue for the resolution of any such disputes. 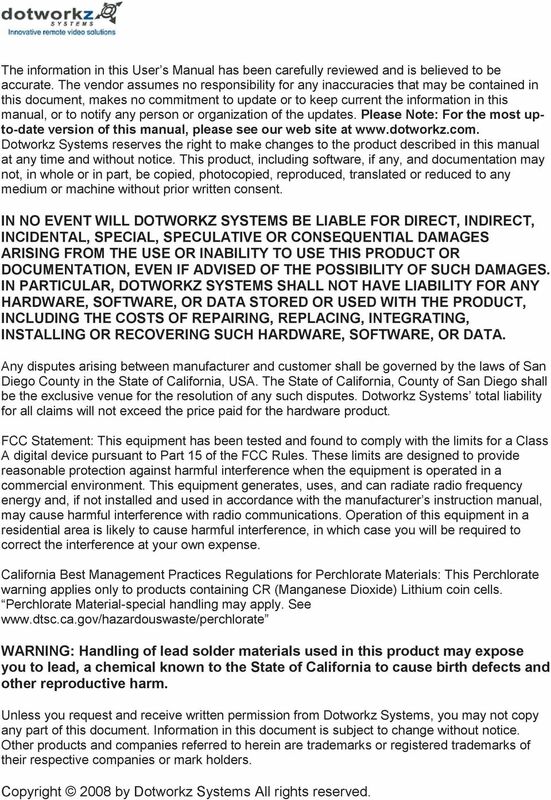 Dotworkz Systems total liability for all claims will not exceed the price paid for the hardware product. FCC Statement: This equipment has been tested and found to comply with the limits for a Class A digital device pursuant to Part 15 of the FCC Rules. These limits are designed to provide reasonable protection against harmful interference when the equipment is operated in a commercial environment. This equipment generates, uses, and can radiate radio frequency energy and, if not installed and used in accordance with the manufacturer s instruction manual, may cause harmful interference with radio communications. Operation of this equipment in a residential area is likely to cause harmful interference, in which case you will be required to correct the interference at your own expense. California Best Management Practices Regulations for Perchlorate Materials: This Perchlorate warning applies only to products containing CR (Manganese Dioxide) Lithium coin cells. Perchlorate Material-special handling may apply. See WARNING: Handling of lead solder materials used in this product may expose you to lead, a chemical known to the State of California to cause birth defects and other reproductive harm. Unless you request and receive written permission from Dotworkz Systems, you may not copy any part of this document. Information in this document is subject to change without notice. Other products and companies referred to herein are trademarks or registered trademarks of their respective companies or mark holders. Copyright 2008 by Dotworkz Systems All rights reserved. 6 1U NVR Machine (JBOD should be used for Live Recording, RAID for Archiving) NVR HD Drive 0 HD Drive 1 HD Drive 2 HD Drive 3 Redundant Default JBOD JBOD JBOD JBOD NO Config. 1 JBOD RAID 0 Striping RAID 0 Striping RAID 0 Striping NO Config. 2 JBOD JBOD RAID 1 Mirror RAID 1 Mirror YES Config. 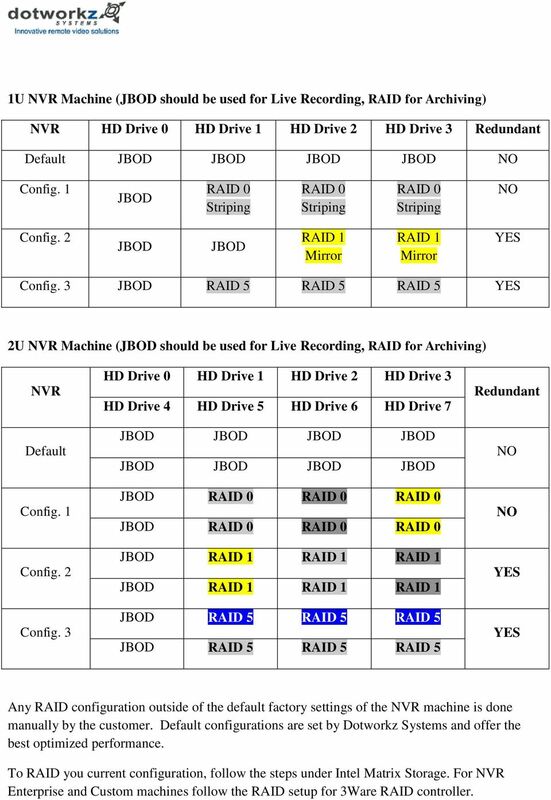 3 JBOD RAID 5 RAID 5 RAID 5 YES 2U NVR Machine (JBOD should be used for Live Recording, RAID for Archiving) NVR Default Config. 1 Config. 2 Config. 3 HD Drive 0 HD Drive 1 HD Drive 2 HD Drive 3 HD Drive 4 HD Drive 5 HD Drive 6 HD Drive 7 JBOD JBOD JBOD JBOD JBOD JBOD JBOD JBOD JBOD RAID 0 RAID 0 RAID 0 JBOD RAID 0 RAID 0 RAID 0 JBOD RAID 1 RAID 1 RAID 1 JBOD RAID 1 RAID 1 RAID 1 JBOD RAID 5 RAID 5 RAID 5 JBOD RAID 5 RAID 5 RAID 5 Redundant NO NO YES YES Any RAID configuration outside of the default factory settings of the NVR machine is done manually by the customer. 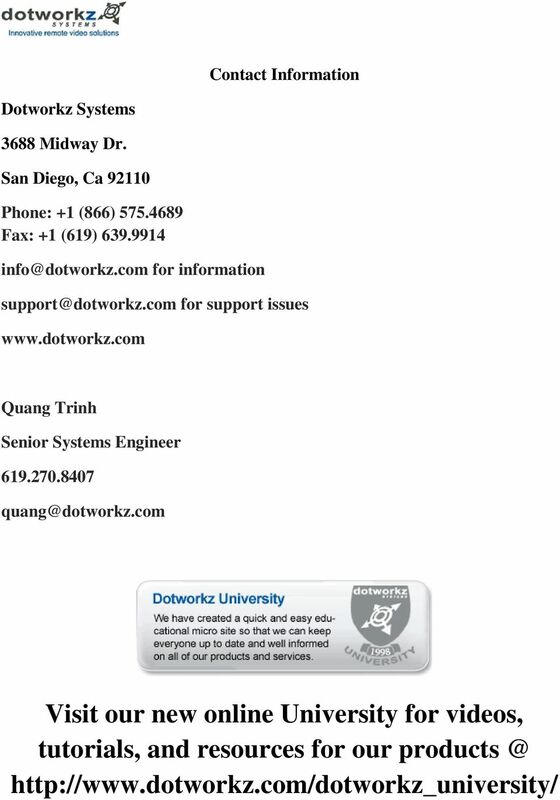 Default configurations are set by Dotworkz Systems and offer the best optimized performance. To RAID you current configuration, follow the steps under Intel Matrix Storage. 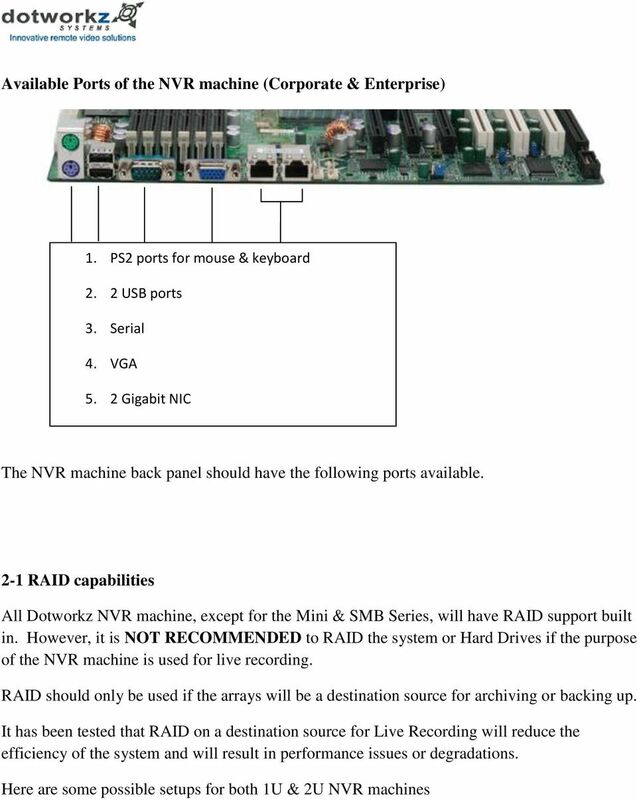 For NVR Enterprise and Custom machines follow the RAID setup for 3Ware RAID controller. 7 2-2 RAID (Intel Matrix Storage Manager) applies to NVR Corporate machine (1U) The Operating System (OS) typically Windows Server 200X series is installed on the Hard Drive residing in port 0 of the HD drive bays unless a custom configuration was requested by customer. This leaves Port 1, 2, &3 open for RAID0, RAID1, or RAID5. RAID O Stripping (striped disks) distributes data across several disks in a way which gives improved speed and full capacity, but all data on all disks will be lost if any one disk fails. RAID 1 Mirroring (mirrored disks) could be described as a backup solution, using two (possibly more) disks that each store the same data so that data is not lost as long as one disk survives. Total capacity of the array is just the capacity of a single disk. The failure of one drive, in the event of a hardware or software malfunction, does not increase the chance of a failure nor decrease the reliability of the remaining drives (second, third, etc). RAID 5 (striped disks with parity) combines three or more disks in a way that protects data against loss of any one disk; the storage capacity of the array is reduced by one disk. RAID Setup 1. Reboot the NVR machine 2. After the Bios has run through its testing procedures hit Ctrl + I to enter Intel Matrix Storage Manager Utility. 3. Reminder that port 0 is typically where the OS is installed on. 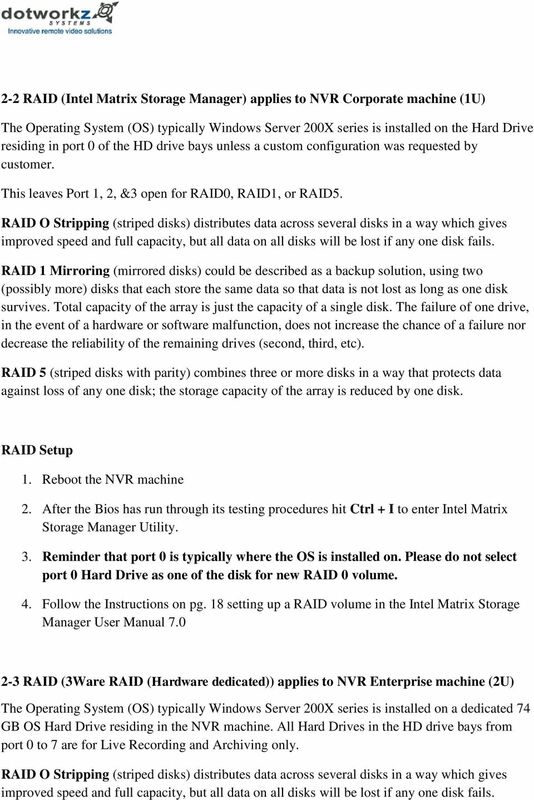 Please do not select port 0 Hard Drive as one of the disk for new RAID 0 volume. 4. Follow the Instructions on pg. 18 setting up a RAID volume in the Intel Matrix Storage Manager User Manual RAID (3Ware RAID (Hardware dedicated)) applies to NVR Enterprise machine (2U) The Operating System (OS) typically Windows Server 200X series is installed on a dedicated 74 GB OS Hard Drive residing in the NVR machine. All Hard Drives in the HD drive bays from port 0 to 7 are for Live Recording and Archiving only. RAID O Stripping (striped disks) distributes data across several disks in a way which gives improved speed and full capacity, but all data on all disks will be lost if any one disk fails. 8 RAID 1 Mirroring (mirrored disks) could be described as a backup solution, using two (possibly more) disks that each store the same data so that data is not lost as long as one disk survives. Total capacity of the array is just the capacity of a single disk. The failure of one drive, in the event of a hardware or software malfunction, does not increase the chance of a failure nor decrease the reliability of the remaining drives (second, third, etc). RAID 5 (striped disks with parity) combines three or more disks in a way that protects data against loss of any one disk; the storage capacity of the array is reduced by one disk. RAID Setup 1. Reboot the NVR machine 2. After the Bios has run through its testing procedures hit Ctrl + 3 to enter 3Ware Raid Utility. 3. Follow the Instructions on pg. 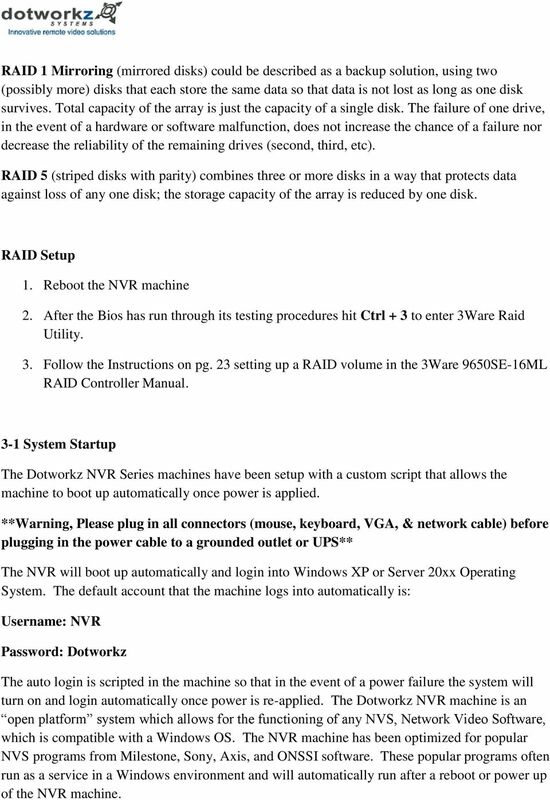 23 setting up a RAID volume in the 3Ware 9650SE-16ML RAID Controller Manual. 3-1 System Startup The Dotworkz NVR Series machines have been setup with a custom script that allows the machine to boot up automatically once power is applied. **Warning, Please plug in all connectors (mouse, keyboard, VGA, & network cable) before plugging in the power cable to a grounded outlet or UPS** The NVR will boot up automatically and login into Windows XP or Server 20xx Operating System. The default account that the machine logs into automatically is: Username: NVR Password: Dotworkz The auto login is scripted in the machine so that in the event of a power failure the system will turn on and login automatically once power is re-applied. The Dotworkz NVR machine is an open platform system which allows for the functioning of any NVS, Network Video Software, which is compatible with a Windows OS. 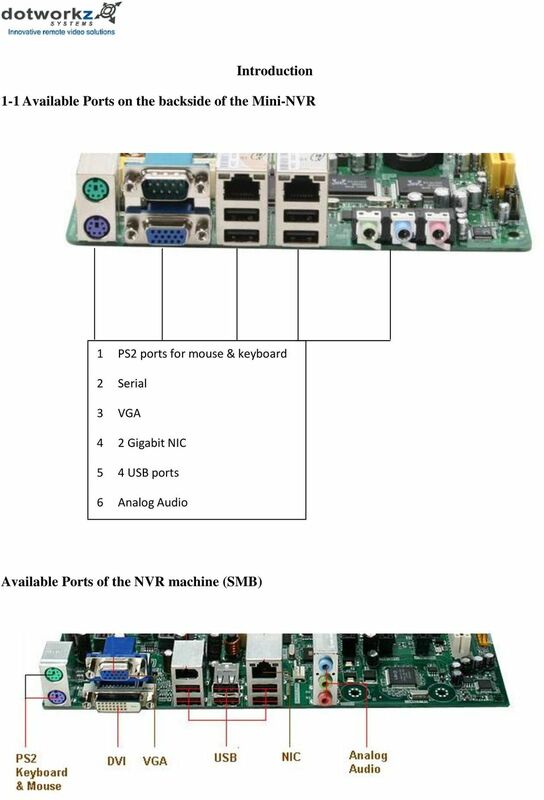 The NVR machine has been optimized for popular NVS programs from Milestone, Sony, Axis, and ONSSI software. These popular programs often run as a service in a Windows environment and will automatically run after a reboot or power up of the NVR machine. 10 4. The reason for this NIC configuration is because the NVR server is acting as a bridge between the two separate VLANs or subnet. a. 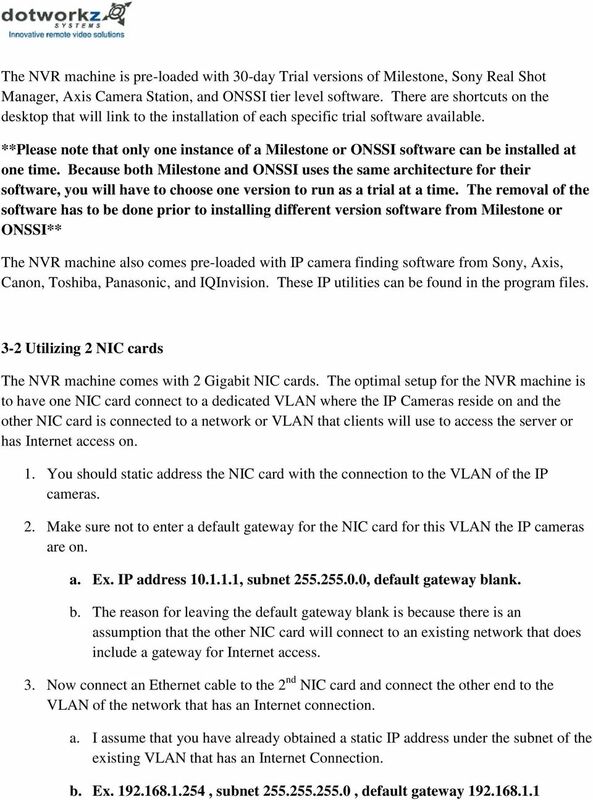 For example clients on the x subnet will not be able to see the IP cameras but instead will only see the NVR machine. This type of VLAN setup assures better network flow and security. 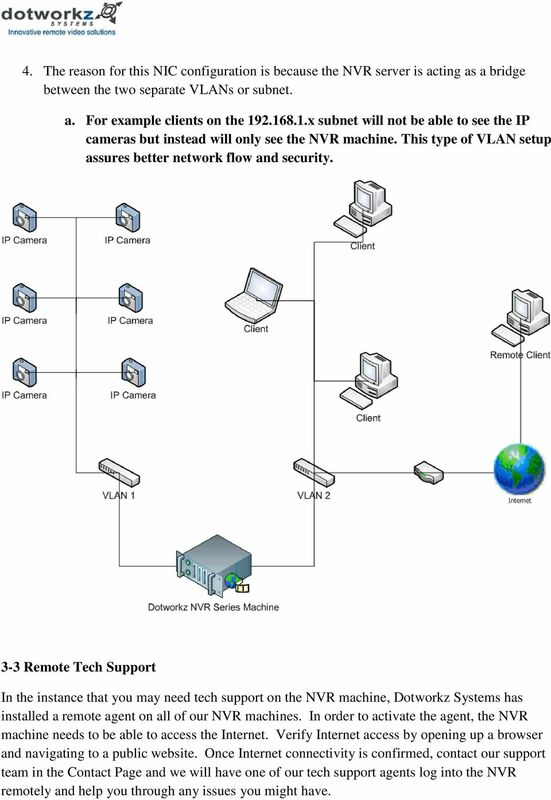 3-3 Remote Tech Support In the instance that you may need tech support on the NVR machine, Dotworkz Systems has installed a remote agent on all of our NVR machines. In order to activate the agent, the NVR machine needs to be able to access the Internet. Verify Internet access by opening up a browser and navigating to a public website. Once Internet connectivity is confirmed, contact our support team in the Contact Page and we will have one of our tech support agents log into the NVR remotely and help you through any issues you might have. SBI-7125B-T1 Blade Module RAID Setup Procedure Revison 1.0 SBI-7125B-T1 Blade Module RAID Setup Procedure The information in this User s Manual has been carefully reviewed and is believed to be accurate.